Santa visited our church's annual Christmas brunch on Sunday. When he walked into the room, Laura spotted the jolly old elf, and her first words were, "ready to go." I figured she would not sit in his plump lap and share with him her Christmas wishes. However, I eventually coaxed her onto his lap, where she stared at him in wonder. Later that day, Jim asked her about Santa. She said, "beard," in reference to his white whiskers. Then she said, "hat," referring to his red Santa cap. And then she said "boobies." This particular Santa's costume was more like an extremely tight-fitting Superman suit. Hence, she noticed his...well...pectorals. She also now believes Santa will always be at church. I told her we were going to church tonight, and she immediately said, "SANTA!" Not sure that is the message we want her to hear. Oh well, she is only 2. 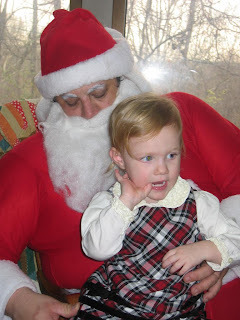 Share your funny Santa Claus experiences.